Another month has flown by in a whirlwind of good days and tough ones, milestones and memories. I simply can’t believe how quickly the time goes by, even though I should remember thinking the same thing with the Littlest Brewster. This is what BIT has been up to this month. Diapers/Clothes: We entirely transitioned her to size 4 Pampers, as we started to get a bit of diaper rash with the 3s and we’ve learned (the hard way) that that’s the sign for our kids to bump them up a size. I’ve also switched her to all 6-9 and 9-12 month clothes. She’s still not as chunky as LB was but she’s definitely longer, hence the 9-12 month sizes. Sleep: After achieving the elusive “Sleeping Through The Night” badge, BIT decided that she would go back to waking up multiple times a night. Her upper respiratory infection, wicked cough, and double ear infection might have had something to do with that. Or she could just be ornery. Hopefully, now that we’ve got a few days of antibiotics on board and the various ailments seem to be clearing up, we’ll get back to a solid night’s sleep soon. The usual routine was bath at 6:30, bottle and bed at 6:45-7, dreamfeed at 9:30, and up for the day at 6:15. Please, oh please let us get back to that soon. Naps are getting to be a little more consistent. Well, consistent in that we know she should have 3, though it doesn’t always happen. Naps have also been screwed up due to illnesses, but maybe we’ll be able to get those back on track soon, too. Eating: BIT usually has 6 or 7 bottles a day, each with 6 ounces. (And yes, I know that’s an insane amount of formula… I think we’ll probably cut one or two out soon and up the amount in the others.) When it comes to solids, we’re still just playing around and not really trying many new foods. She has had apples, avocado, beets, carrots, oatmeal, sweet potatoes, and yogurt, as well as a couple of things that we probably should not have given her, such as the soft filling of a spinach pierogi. (She thought it was delicious.) With the two recent courses of antibiotics, I got this probiotic at WholeFoods to try and restore the happy balance in her gut. She’s only had two doses so far and she still has squidgy antibiotic poo, so I can’t really speak to its efficacy yet. Teeth: Yep, you read that correctly. BIT is the proud owner of two teeth! Her two bottom middle teeth came in over the last month, though they’ve just completely broken through the gums. Like her sister, teething didn’t really seem to bother her all that much, though the kid loves chewing on things. All toys go immediately in the mouth, much to her sister’s consternation. Other Milestones: BIT has fully mastered the army crawl, though I think she looks more like a zombie coming to chew your toes off. She moves one elbow and then reaches out with her opposite hand and pulls herself along, very a la Walking Dead. If you put her in a tripod position, she can maintain it for a bit and play with toys in front of her, which is fun for her. And she hasn’t quite gotten the hang of the raspberry yet, but she’s working on it. 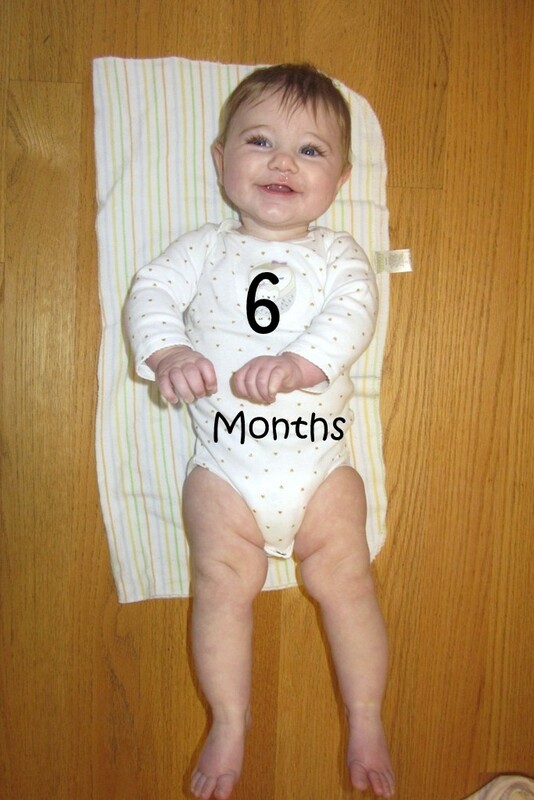 This entry was posted in Babies, Home Life and tagged BIT, Monthly Updates by BrewsterMama. Bookmark the permalink.